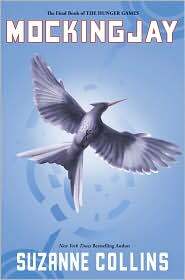 As someone who never caught the Harry Potter bug, the Hunger Games series has been a significant literary event. The first book impressed me. The second transcended the usual sequel curse by being both true to (and better than) the first book, except for its ending. That put part three in an awkward place. Having pretty much hated the ending of book two, would I really enjoy book three? There really wasn't much of a choice as to whether I would read this last installment -- I was seriously invested and thus I had to read it. Mockingjay picks up a few weeks after Catching Fire. The basic gist is that the districts are now rising up and the leaders of the uprising are looking to Katniss to play the role of the agitator. The truth, though, is that (just as in the Games) it is the image of Katniss that they want -- her real self is not actually all that interesting. Still, she wants to be helpful and reluctantly agrees to help out as she can. Along the way, she has plenty of ghosts to face and unresolved issues with her two loves (Peeta and Gale). There are several interesting tracks to this much darker installment in the series. Having expanded out of the colliseum of gladiator games, Collins is building in a much larger theater both physically and narratively. There is, of course, the action story (the part most likely to be adapted into a movie, if rumors of a film optioning are true). There is also a very complicated political story about paranoia, corruption, the impact of the media, and the depths of greed. These themes have been present in the previous novels but Collins expands on them here. Finally, there is the personal story of Katniss herself and how she copes with survivor guilt, vulnerability, and her conflicting desire to act. Sadly, this last part is the most neglected part of the story. While she is constantly plagued -- to the point of reader distraction -- with guilt and doubt, her ability to work through those feelings remain underdeveloped. A friend commented that she felt that Collins rushed the ending. I'm prone to agree. In the last half of the book, Collins jumps from one thing to another, seemingly uninterested any longer in her characters or even in the story. It seems as if she simply can't wait for the whole thing to end.